Safe, Reliable Power for projects that require more than plug-in transformers or battery wands to power your window treatment motors. Fully wired and ready to install right out of the box. Includes a 6Ft power lead that plugs directly into a wall outlet or surge strip. (1) UL-Listed 8"W x 10"L x 6.25"D NEMA Type 1 Enclosure with Continuous Hinge, Black Quarter Turn Latch, .063" Carbon Steel-Gray Powder Coated inside and out, 4-Mounting holes, One 6 Ft 16AWG Grounded Power Cord. One shade power wire 1/2" knockout and clamp is provided for every three shades. 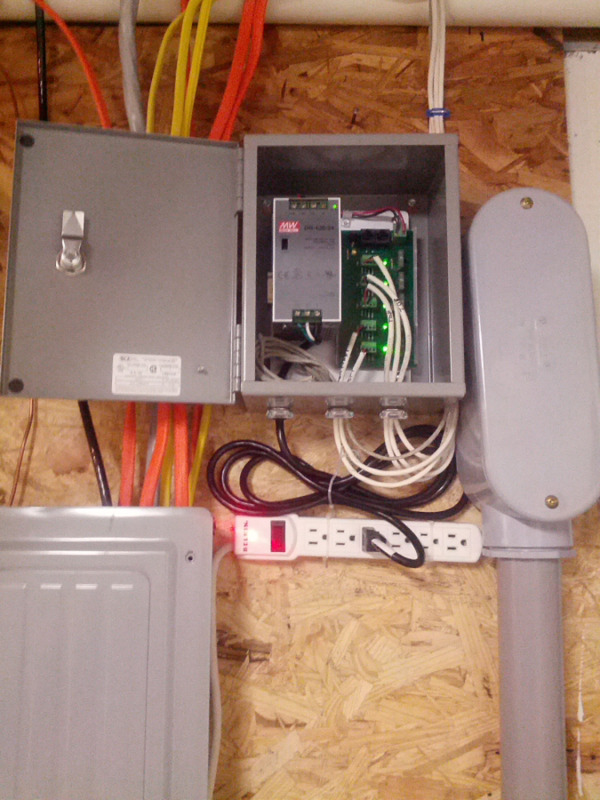 Wire Knockout location can be specified at Top or Bottom of Panel. (1) UL-Listed Meanwell SDR-240-24 DIN Rail transformer delivers 10 Amps of power with peak load capability of 360 Watts for 3 seconds. 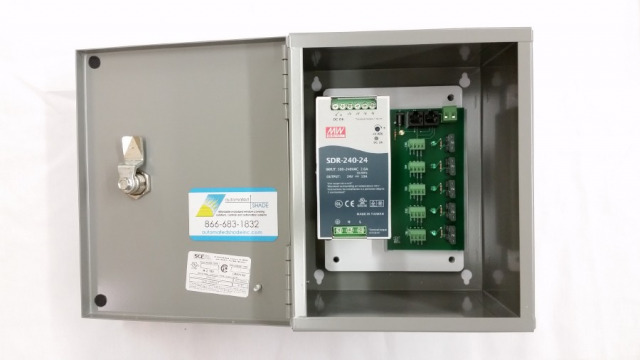 UL508 Industrial Control and complies with GL Marine and SEMI F47. Input Voltage 90~264vac @ 2.6 Amps. Operating Temperature Range: -25~+70°C. High Efficiency 94% with Built-In PFC power supply with Standard Protections: Short Circuit, Overload, Over Voltage and Over Temperature. 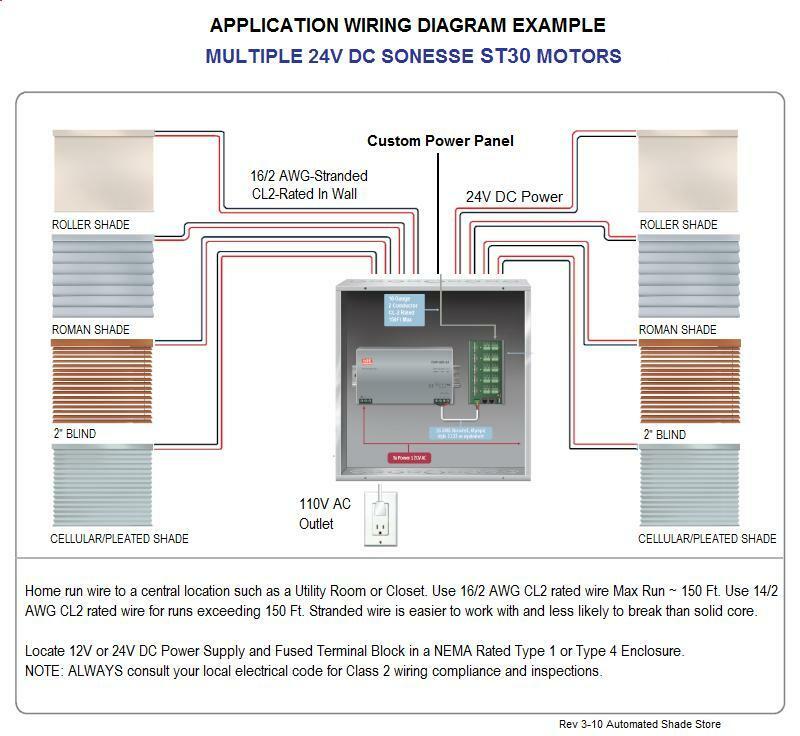 Always be sure to plug your Power Panel into a quality surge strip to provide additional protection from Power Surges and Lightning Strikes that will damage DC motors.